As many of you know, I am in the process of writing segments of a new textbook for an international wine education program. Our first course is going through a test run in Madrid, Spain, as I write this blog. We hope to expand to the United States in the next few months. Right now, we are developing the level 1, or introductory course, which emphasizes grape growing, winemaking and explores the noble grape varieties. So, this week, I thought I'd share a very abbreviated version of my discussion on the Sangiovese grape (which runs about six pages in the textbook). Sangiovese is like a Dickens novel that begins with, “it was the best of times, it was the worst of times”. 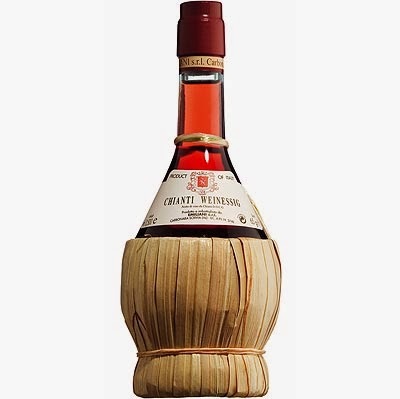 Sangiovese is the source of some of the finest red wines in the world, but it is also the cheap red wine packaged in a straw-casked bottle (fiasco), which is more popular as a candle holder. The origin of the Sangiovese name is pretty well debated, but general theory is that it derives from Sangue di Giove, or Sangius Jovus (“blood of Jove” or “blood of Jupiter”), and was given that name by monks in Emilia-Romagna. Once believed to be a native and noble grape of central Italy, recent DNA evidence confirms that Sangiovese is the offspring of the north and south. The northern grape is Ciliegiolo (“little cherry”). The southern grape is Calabrese Di Montenuovo. It probably originated in the Calabria region before moving its way up to Campania, and eventually Tuscany. Today, Sangiovese has different names in different regions. The best known are Prugnolo Gentile in Montepulciano, Brunello in Montalcino, and Morellino in Grosseto. 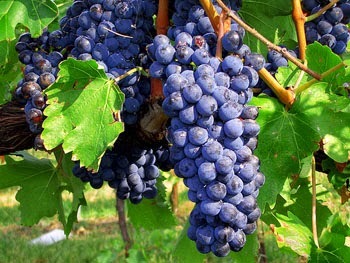 All of these are said to be sub-varieties of Sangiovese, all of which fall into two basic categories: Sangiovese Grosso and Sangiovese Piccolo (or Sangioveto). The primary growing region of Sangiovese is within central Italy, mainly the Tuscany region where the most famous wines are made. Some of the best known regions are found along the foothills of the Appennines mountain range. 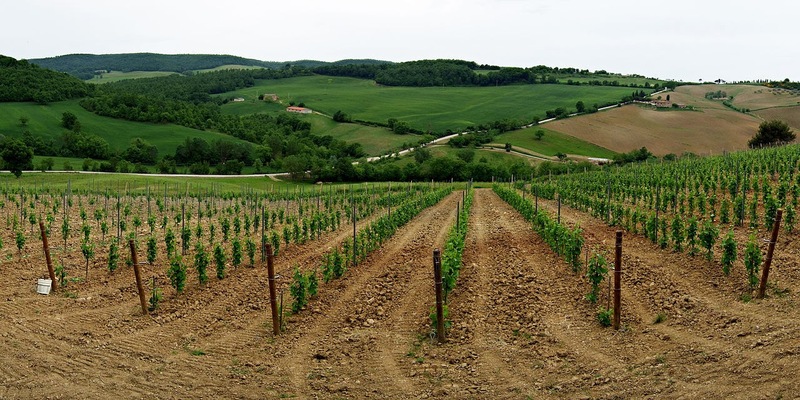 The Chianti region is probably the best known. Wines may be labeled Chianti or as one of the 8 sub-zones of Chianti. Chianti Classico and Brunello di Montalcino produce some of the best known, and loved wines in the region. While Sangiovese is the grape that typifies Tuscany, it is Brunello di Montalcino that stands alone as the region which makes 100% Sangiovese. Here the moderating influences of the Mediterranean help create the most intense expression. Sangiovese is not well travelled in the old world. There are small pockets of growth in Greece and Israel. The largest growing area outside of Italy is in France. In the new world, Sangiovese has had mixed results. I remember one of the first Sangiovese wines out of California. 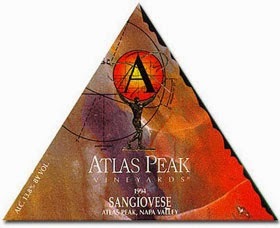 It was produced by Atlas Peaks (at that time the Tuscan firm of Antinori had a stake in the company). While their initial experimentation may have failed, it did open the door for other producers. Small production remains in California, with growing success, in the Central Coast, Sierra Foothills, and North Coast. There has also been some experimentation in Washington. Chile and, especially Argentina, are showing promise. Since the Sangiovese grape is thin skinned, it is naturally low in anthocyanins (the natural phenolics that are found in the skin), that give the wine its color. This is why it has historically been blended with lesser-known grapes that can add color, such as Canaiolo and Colorino. The grape also tends to be high in tannin, acidity and aroma. For this reason, Sangiovese has historically been blended with both white and red grapes, to make up for what was missing. "Super Tuscan" wines are blended with Cabernet or Merlot. Sangiovese is the "workhorse" grape of central Italy It can produce everything from everyday drinking to premium wines in a variety of styles. Mostly known as a red still wine, Sangiovese also is used to make rosato (rose), sweet passito, semi-sparkling frizzante and the luscious dessert wine, Vin Santo. The thinner skins mean that typically, the color is not particularly deep. Traditional expressions tend to be a pale ruby or garnet color, with a brownish-red rim. Acidity is high, and tannins are moderate to high, both of which contribute to the wines aging potential. Alcohol levels are typically moderate, but as riper fruit is utilized, the alcohol levels can increase up to around the 14% range. Aromatics are typically moderate in intensity with a distinct black cherry aroma. This primary fruit aroma is supported by a range of savory vegetal, almost foresty, aromas of dried leaves or underbrush, tea, tobacco, straw—and occasional violet and smoke elements. More modern styles will have notes of vanilla and spice from the new oak. The finish on younger vintages can be somewhat bitter. In Italy, wine is part of the meal. Sangiovese's high acidity and moderate alcohol makes it a very food-friendly wine when it comes to food and wine pairings. The high acid, makes it an ideal match to all types of food. Almost anything with tomato sauce works well. Tomato-based pasta dishes, pizza sauce, Porcini mushrooms and Pecorino Cheese are perfect with Sangiovese. 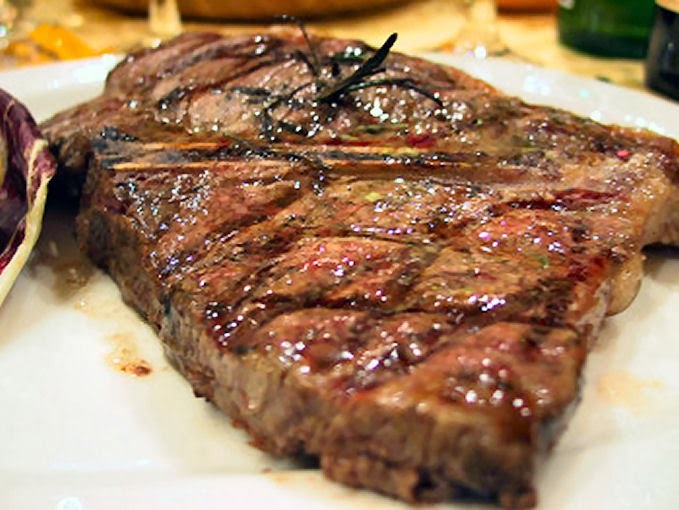 One of the classic pairings is bistecca alla fiorentina (a huge grilled T-bone steak).